More details can be found on the Wikipedia page ‘Kaprekar’s routine’. It has been a very long time since I did any programming on the ZX Spectrum, it must be over 25 years ago now, so I was keen to take a crack at it. 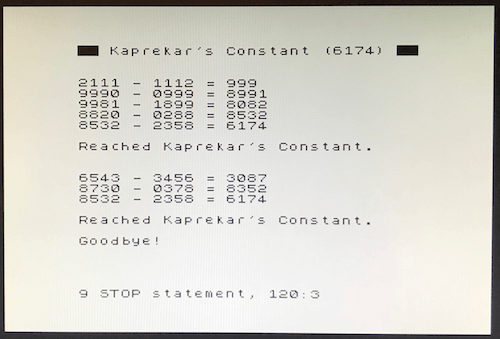 20 CLS: PRINT "██ Kaprekar's Constant (6174) ██"
I am sure the code can be optimized further (surprised too see how much I have forgotten over the year, but also how quick some thing are coming back) but giving the fact it has been ages since I last coded for the ZX Spectrum I am happy with the results. At least it is working . It also brought back memories about having sore fingertips after entering code for hours on end on that rubber keyboard .